We are going to see how to register a blog on Google Blogger in simple step-by-step process. I prefer to work with Blogger because Google offers excellent services when it comes to supplementary activities required to promote, track and monetize the blog. It's simplistic and elegant interface makes blogging job painless than any other blogging services available on the internet. Blogger service is provided by Google and we all know that how well-reputed it is in the field of internet. Blogger is most secure and trusted platform for bloggers. It not only provides free hosting but also free domain which can be upgraded to paid service of our choice if we wish to. Unlike most of other blogger services which comes with a little price. I would insist to go for free service if you are absolutely new into blogging. Get known with blogging insights and then you may go for paid service. Centralized access control with single Google account for various services makes your life even easier. Google Analytics to observe traffic flow of your blog and user behaviour, Google Webmasters to track your performance in search engine results, Google Photos to store images and Google Drive to store other file formats, Google Adsense to advertise on your blog, all this can be managed with the help of single Google account. There is no need to worry about it if you find programming a complex task. You will find plenty of attractive web templates and widgets available online absolutely for free to serve your purpose. Now let's see the procedure for registering your blog on Google Blogger. First and foremost thing, you will have to register for Google Blogger service with the help of Google account, which is a normal registration process. Once you have set-up username and password for the account, you will be redirected to Blogger Welcome page. You will see an option to Create New Blog. Click on this button. Enter your blog details, like Blog Title and URL by which readers will find your blog. Choose a template from the gallery and hit "Create blog!" button. See below picture for reference. Note, any of these details and template design can be changed in the lateral phase of the blog design process at any point in time. Theme: You can set overall look of your blog from this menu option. You will see a couple of blogger themes/designs available on the page. Select any design from the gallery and apply it. You will see your blog in complete new design. That easy it is! Click on "Customize" button, if you wish to change color themes or font settings of the current theme applied. If you wish to add the template for your blog from some other source than Blogger, then you need to click on "Edit HTML" option. You will need to replace the XML code into text editor box with XML code of the template you have chosen from the external source. Also, you can set layout for the mobile users. Choose a theme which is elegant in look, responsive on various screen, easy to understand and have additional features you might consider. Basic: This setting option will let you update Title, Description and URL of the blog. Put these details very wisely so that with the single glimpse user would come to know what your blog is about. You can set whether to display your blog into search engine results or not within this option. Post, Comment and Sharing: A blog author can set a number of posts (articles) to be displayed in a single web page within this option. I chose to have 1 post per page. Users can prefer to display 5 or any number of posts per page as per their choice. Whether to allow readers to comment on your blog post or not, who can comment, do these comments need moderation before publishing live and if your blog content can be shared on social networking sites, all these details can be set within this option. Email: If you wish to post content through custom blogger email-id then you will have to create an email id by going into this option. Language: Blogger let you post articles into the regional language. All you need to do is change the default language English to language of your choice from the drop-down list. It also lets you set regional time and date settings. So when you plan to publish any content it will go live as per set time and will display the date in the format set here. Search preferences: Generally Meta tags helps search engine to read a web page. In order to have better visibility to your blog in search results, Meta tag description must be set. This Meta description text can be set here. For page not found errors and redirection request, message or redirect URL can be set here. Whether crawlers of search engines can crawl and index your web page can be set here. 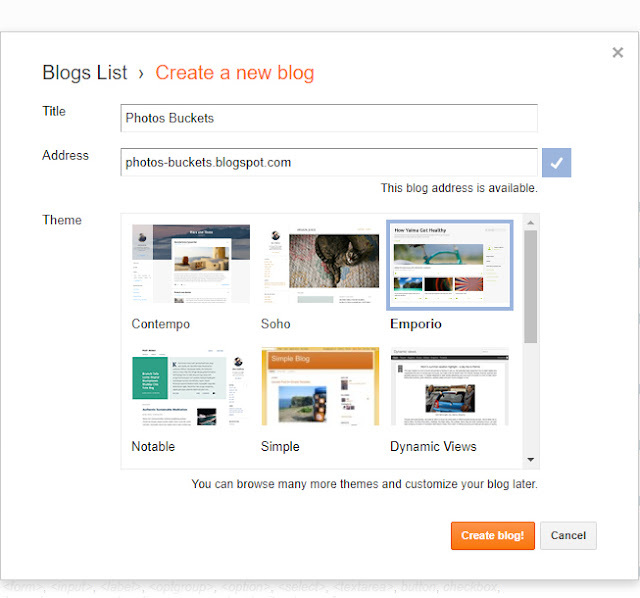 Other: This option lets you import content from another blogging platform to Google Blogger. Also, you can take backup of your current posts and upload that content to another blogging platform. If you wish to delete blog for say some reason, you can do it from this option. You can set site feed and Google analytics to understand visitors behaviour and few other details into this option. User settings: Details concerning your blogger interface control panel can be set here. If you want the entire control panel to be displayed in regional language, that can be set by going into this option. Layout: One can set layout and display order of the blog elements by dragging and simply dropping content boxes into the appropriate location. The simple interface let you position the elements by dragging and dropping. You can introduce new widget/sections for a web page or delete existing section from the web page. Do not forget to hit "Save arrangements" button after doing changes to the layout. Posts: This tab lists all published articles and drafted articles from your blog. You can choose to update, delete or alter any of the of the post by choosing it from the list. If you wish to publish new article same can be done by clicking on "New post" button. All tools listed in editor window have been explained in detail in blog post How to Write the First Blog Post. Comments: Comments tab lists all comments received from your readers. You can moderate them from within this tab and decide whether to publish or completely discard them. There are few more tabs like Pages which let you create a stand-alone post, which can be used on special purpose to redirect users to the specific page. Stats tab lets you monitor the performance of your blog. It will show you how many users have visited a particular web page, which page is visited, the source of the visitor, etc. You can choose to monetize your content by displaying advertisements in a web page from the tab Earnings. We are gonna cover that part in detail in another post. Also, you can set goals in order to reach readers, create an advertising campaign and advertise your blog over the network by going into Campaigns tab. Within this post we had a look at how we can register a blog on Google Blogger. We discussed how Blogger platform is better in terms of security, simplicity to use and supportive in terms of other Google services. We had a look at setting up the domain name and title of the blog. Along with we understood Blogger Dashboard interface and various options to control blog settings. Hope you enjoyed this article and will register your blog very soon. Please give it a share and comment your thoughts. We will have a look at How to Write the First Blog Post in our next article. Indeed u have a great tips here, reading up your post has gain me some hints to apply in my blogging skills. Thanks for sharing and am glad to be here. Glad that I could contribute something which is helpful for us fellow bloggers.